In this study, we report removal of Diclofenac (DCF) through heterogeneous Fenton process using Fe-ZSM-5 catalyst. The parent catalyst was prepared by hydrothermal technique. Fe species were introduced by wet impregnation. 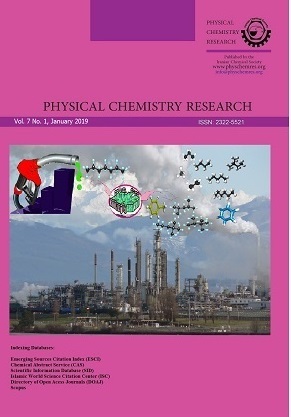 Characterization of the catalysts was carried out using XRD, FT-IR, FE-SEM, N2 adsorption-desorption, NH3-TPD, and acidimetric-alkalimetric titration. The bimetallic catalyst had the high crystallinity (81.2%), specific surface area (291.8 m2g-1) and uniform spherical morphology. Effect of pH, temperature, catalyst concentration, and H2O2 concentration on DCF removal efficiency was investigated. 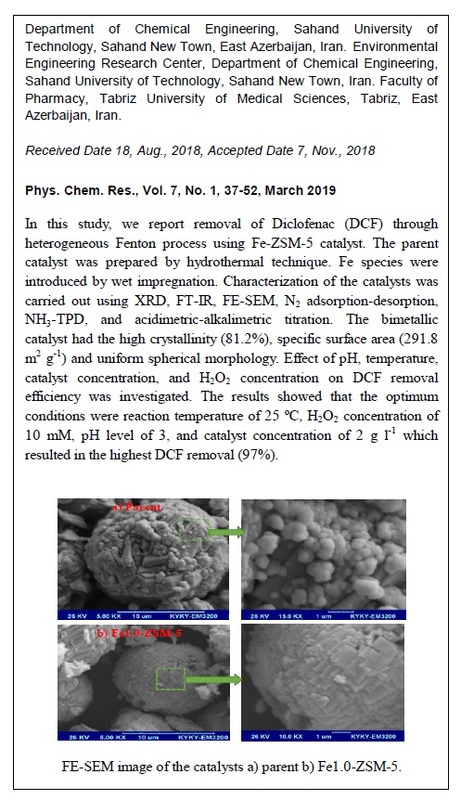 The results showed that the optimum conditions were reaction temperature of 25 ºC, H2O2 concentration of 10mM, pH level of 3, and catalyst concentration of 2g L-1 which resulted in the highest DCF removal (97%). The catalyst was applied in the sequence cycles at the optimum reaction conditions which had no significant change in the catalytic performance. The prepared catalyst showed the high potential for the treatment of the pharmaceutical wastewater due to the high efficiency and stability.